The five Kenyan women were covered from head to toe as they stood in front of an African garb-wearing Dirk Nowitzki. One was the love of the Dallas Mavericks forward’s life and the reason they were in Nanyuki, Kenya. The others were decoys who if incorrectly chosen could cost the 13-time NBA All-Star a goat as punishment. The 7-foot German nailed tough shots in the NBA Finals and the Olympics, and on this occasion he did the same, correctly picking his bride Jessica Olsson. “It was awesome,” Nowitzki told The Undefeated. “They took my wife away. They brought five or six girls out and they were all covered. So the first thing I had to do was find my wife. So I’m walking around and looking at how tall they are. Nowitzki is a worldwide known basketball name. He is the Mavs’ all-time leading scorer, the 2011 NBA Finals MVP, the 2007 NBA MVP and a two-time FIBA Europe Player of the Year. Basketball also introduced him to his wife. Dirk Nowitzki and his wife Jessica Nowitzki attend the premiere of the film ‘Nowitzki. Der Perfekte Wurf’ at Cinedom on September 16, 2014 in Cologne, Germany. Jessica Nowitzki is the daughter of a Kenyan mother and Swedish father. Her mother is from Nanyuki, Kenya, a market town located northwest of Mount Kenya that was founded by British settlers and is the home of the Kenya Air Force. Jessica was raised in Sweden with her younger twin brothers, Marcus and Martin, who are both professional soccer players in England who also have played for the Swedish National Team. Nowitzki hailed from Würzburg, Germany, a town of about 125,000 people that didn’t include many black or African residents. The racial differences never mattered to Nowitzki, as he quickly became smitten with “Jess” after they met. “What made her so special? What made me fall in love with her? First of all, she’s got to be attractive. That’s obviously part of it,” Nowitzki said with a big smile. “And I think we just clicked intellectually. She likes art, she likes sports. Her brothers both played soccer, they were professional. Although race wasn’t a big deal to Nowitzki and Olsson, it became a topic when their relationship became public. 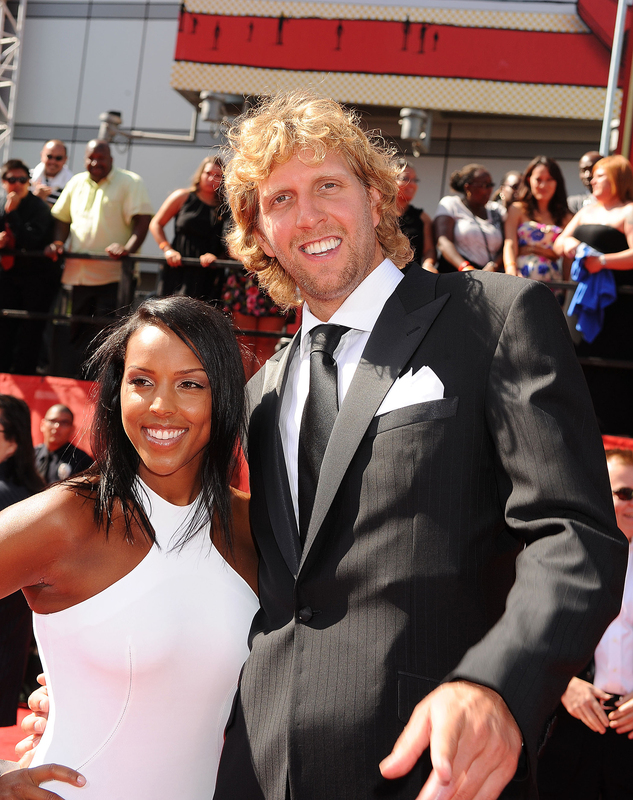 Nowitzki and Olsson made their first big public appearance on July 13, 2011, when they were on the red carpet at The ESPYS awards together. They received a lot of comments on Twitter when he kissed her after winning an award during the televised show. The Twitter chatter was not necessarily negative, but it was race-related. Dirk Nowitzki arrives at the 2011 ESPY Awards at Nokia Theatre L.A. Live on July 13, 2011 in Los Angeles, California. WNBA star Candace Parker used the line “jungle fever” on Twitter and wrote “love it” after they smooched. Nowitzki said he has never heard any racial comments in regards to him and his wife. So how did Nowitzki refrain from color ever being an issue to him? “Growing up in Germany, and basketball,” he said. “We’ve always grown up around all sorts of races. I played with the national team where half of my teammates were from Yugoslavia. Color or race for me never really mattered, and that’s also the beauty of sports. 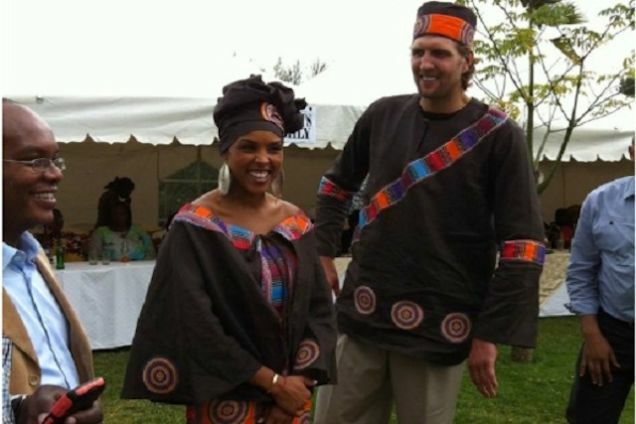 Nowitzki and Olsson were married in July 2012 with traditional wedding ceremonies in Germany and Kenya. In Kenya, they had a Kikuyu wedding where the community learns that the daughter is engaged and relatives from both sides get to intermingle before it concludes with a “ruracio” (dowry payment) discussion. The bride wore a traditional Kikuyu garment while the groom was in a dark brown traditional outfit with orange hues. The traditional Kenyan wedding in her hometown of Nanyuki was a new experience for both the bride and groom. Dirk Nowitzki and his wife, Jessica, on their wedding day on July 20, 2012 in Dallas, Texas. “Her mom threw a wedding party and that’s where some of those photos came from where I had the outfit on with a hat on,” Nowitzki, who loves Kenyan stews and barbecue, said. “It was a special experience. I’ve never, obviously, been a part of anything like that, the dances, the whole experience, the tradition of a wedding down there. Payment of a dowry is an old African tradition used to demonstrate the groom’s ability to provide for his bride. In the past, Kikuyu weddings included a dowry payment by the grooms of cows, goats, honey, green bananas and/or traditional brews. Modern-day weddings include cash dowry. So what did Nowitzki — a multimillionaire certainly financially capable of providing for his wife — pay in dowry? The Nowitzki family has quickly grown, as they now have three children, a girl and two younger boys. They all went back to Kenya last summer. The plan is for the Nowitzki children to spend time in Kenya and Germany yearly to learn their heritage. Olsson’s mother has died since the wedding, but there are still a lot of family members in Kenya whom the Nowitzkis want their kids to know. The Nowitzki family’s next trip to Africa might include Nowitzki playing in a basketball game. The NBA and the National Basketball Players’ Association hosted the first NBA game in Johannesburg on Aug. 1, 2015. Nowitzki wanted to play, but didn’t because he was previously committed to attend a friend’s wedding as best man. Several sources expect another NBA exhibition game to take place in Africa this summer. If so, Nowitzki would like to play in it. “I’m trying to pull it off. I heard it was a great event to go to,” Nowitzki said. Nowitzki is now 38 years old and in the twilight of his projected Hall of Fame career. Upon his NBA retirement, the Nowitzkis are expected to reside primarily in Dallas. Olsson has been living in Dallas for about a dozen years and has lots of friends and some family there, too. But Nowitzki knows that there will be some challenges that his children, most notably his boys, could face being black in America. Nowitzki described what he saw in 2016 as “not pretty” in terms of racial and social justice. He believes that education, respect and discipline are key to keeping his children out of harm’s way. “You always worry for your kids. Are they going to fall out the crib? Are they going to make the right decision later? Who they’re dating? Are they going to run into a cop one of these days? You always worry as a parent. That’s something for sure that’s in the back of your mind, but eventually educate them the right way and keep teaching them how to respond. Nowitzki recalls his father playing “no games” with him as a child and having a belt hanging over a lamp if needed for discipline. Nowitzki said he instills discipline and respect with his kids, but also love. “What I’m trying to do now with my kids is raise them with love,” Nowitzki said. “So they got to show you authority, got to show some respect. Not anything goes. That’s not how it works around here.